Are you looking for a excellent yet affordable way to reduce player injuries, add fun color to your field, and increase fence visibility? Then our chain link fence toppers are for you! 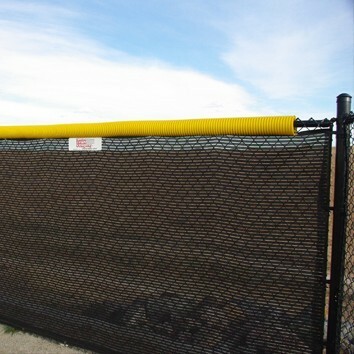 BaseballFenceTopper.com is thrilled to offer you our best possible deals on chain link fence toppers. Our fence toppers are brighter and thicker than competing products, which will add years to your chain link fence topper's valuable lifespan. Other chain link fence toppers are thinner and lighter, allowing the sunlight to penetrate the topper, making it brittle and deteriote much more quickly over the years. High-quality yet inexpensive, they're a perfect fit for all of recreational fencing needs. 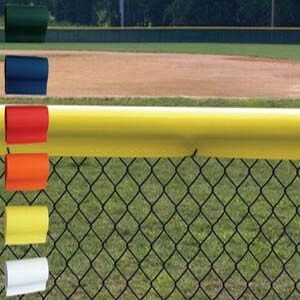 No longer will your players snag or cut themselves on your fence when reaching for that outfield hit! Protecting your players is a top priority and using our chain link fence toppers, which are all thick and treated with UV-stabilizers, will protect both your players and your fence from the rust and corrosion that would normally affect a chain link fence over the years. Our chain link fence toppers are both easy to install and come in many options for size, thickness, and color, allowing you to find the perfect topper for you! Available in yellow, green, black, blue, and white, our fence toppers will add beauty to any field. Don't be tricked by cheap, flimsy, thin walled look-a-likes, demand the best value for your money and choose Baseball Fence Topper for all of your chain link fence topping needs. With many safety and eye appealing benefits and our valuable options, it is a wonder why any field would go without a chain link fence topper. For more information on baseball fence crowns, please contact our customer service team at 1.800.878.7829 to speak with one of our trained professionals today!